We believe in a productive, fresh cuisine. That is, the food is prepared and served at the same place, there is no use of any powders, preservatives or frozen food. Behind every line on our menu there is a whole process of preparations, where the emphasis is on product freshness and flavour variability. 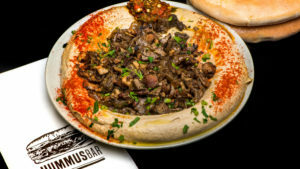 At the Hummus Bar you should feel at home – indeed at times it feels slightly crowded, yet every customer knows he is welcomed and cared for. We work hard in the kitchen for that reason only and our staff is devoted for your overall experience and satisfaction. We highly recommend booking a table in advance, which you can do online!